Last week I shared the good word that Mt. Pleasant had been awarded a grant to open a Temporium at 3068 Mt. 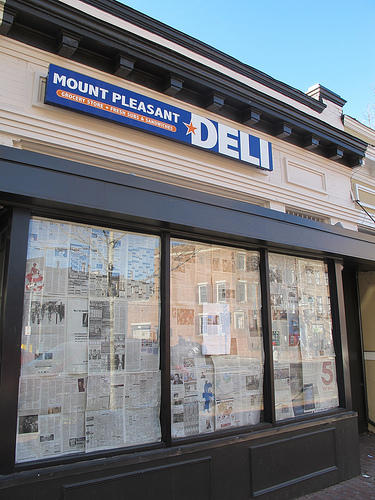 Pleasant St. for Jan. and Feb.
As part of the city’s new Temporary Urbanism initiative, the DC Office of Planning (OP) has awarded Mount Pleasant Main Street (MPMS) a grant to establish a “Temporium” in an unoccupied retail space at 3068 Mt. Pleasant St. NW. A Temporium is a temporary, pop-up retail space for local artisans to exhibit and sell their work. The Mt. Pleasant Temporium is scheduled to open for 24 dates between late January and February. The Mt. Pleasant Temporium, scheduled to open for 24 dates beginning in late January 2011, will feature handmade goods for sale from 20 local, independent crafters and artists, as well as special programming that includes autobiographical and theatrical storytelling, trunk shows, educational panels, and live music. The Temporium will be developed in partnership with Mount Pleasant Main Street, SpeakeasyDC, Hello Craft, Radio CPR, Partners for Livable Communities, the DC Office of Planning, and several neighborhood-based community groups. At the time a reader noticed that this is the space that Nana is moving into. I spoke with the owner of Nana’s clothing boutique and she confirms that it is indeed the same space. She assured me that Nana will still be moving into that space when the Temporium closes. Good news all around!